I've been using Uniq One for a over a month. I love it and recommend it for hair that's thick and damaged. 1. Repair for dry and damaged hair. 2. Shine and frizz control. 5. Hair colour protection/with UVA and UVB filters. 6. Easier brushing and ironing. 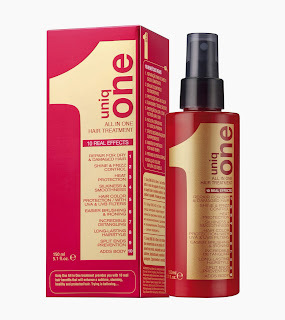 Uniq ONE All in One Hair Treatment is the ONE solution you have always dreamed of. Uniq One is an excellent leave-in treatment, I love the results so much that I've recommended it every chance I get. I don't recommend this treatment for thin hair, it may be too heavy. It's cream in a spray bottle making it easy to apply and spread evenly throughout my hair. Unlike other treatments, the excess doesn't just drip away. My hair instantly looks shiny and the comb glides through the tangles like a dream. Significantly reducing my blow drying time, my flat brush glides right through. It protects my hair from the heat of the flat iron and the end results are shiny, smooth, flowing, hair. If you want to see your hair go from dry, damaged or over-processed to soft, manageable and healthy, I suggest you run out and get a bottle right now. There are other products that claim to do what this product does but they cost a little more. The price for Uniq One can’t be beat, usually about $20 dollars before taxes here in Toronto. I picked it for $19.99CAD at Cosmetic World (http://www.cosmeticworld.ca/) on Yonge Street.